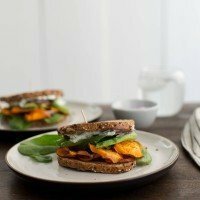 Chili Roasted Sweet Potato Sandwich | Naturally.Chili Roasted Sweet Potato Sandwich | Naturally. Using a mandoline, slice sweet potatoes into thin, 1/16″ slices. Place in a large bowl and cover sweet potatoes with water. Let sweet potatoes soak for 30 minutes. Drain the water and pat completely dry with a tea towel. Preheat oven to 375˚ and cover two sheet trays with parchment paper. Toss the dried sweet potato chips with the olive oil, sambal oelek, and salt. Place sweet potatoes in a single layer, not overlapping, on the sheet trays. Bake sweet potatoes for 10 minutes, flip, and continue to bake for another 10 to 15 minutes, checking every five minutes. Remove sweet potato chips as they begin to curl and look dry. The chips should crisp as they cool (don’t stack-leave them in a single layer). While the sweet potatoes are baking, in a small bowl combine the yogurt with feta, cilantro, lemon juice, lemon zest, and a pinch of salt. When sweet potatoes are done, assemble sandwiches with a few layers of sweet potato chips, a small handful of spinach, a few slices red onions, 2 to 3 slices avocado, and a couple tablespoons of the yogurt sauce. Eat immediately or else sweet potatoes will loose crispness. + Key to getting good sweet potato chips: Rotate the tray and after that, check the chips every 5 minutes. Any chip that looks like it’s going to start burning around the edges, pull it and put it on a separate baking tray. Continue until all the chips are done. Make sure your slices are even, 1/16″ if possible. These chips can be finicky but you want them to be crisp. If you’re concerned, slice in 1/4″ and go for soft roasted sweet potatoes (like this).